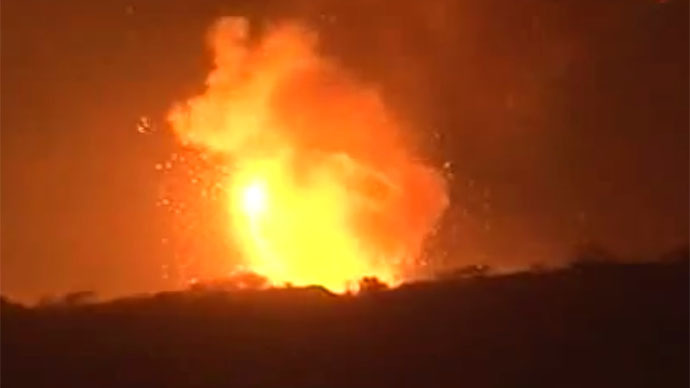 Pillars of fire are rising over the Yemeni capital of Sanaa, according to dramatic images flooding social media, amid reports that a Scud missile facility on Faj Attan Hill, just outside the city, has fallen under a new attack. The reports have not yet been confirmed. It is also not immediately clear whether the coalition's airstrikes are the direct cause of the blast. The warehouses already came under fire both the previous night and the day before that. The base reportedly stores a large portion of Yemen's R-17 Elbrus (Scud-B) missiles and Transporter Erector Launchers (TEL). The Saudi-led coalition of several Gulf States, Sudan, Egypt and Morocco has been bombing Yemen since last Thursday in an attempt to weaken the Houthi rebels, who took control of country after resignation of president, Abd-Rabbu Mansour Hadi, in January. Also on Monday, an airstrike by the coalition hit a rebel-controlled refugee camp in the northern Yemen, killing 45 and injuring another 65 people, the International Organization for Migration (IMO) said. An arms depot was also bombarded in the country’s second city of Aden on Saturday, leaving 14 people dead. The Houthi uprising began in Yemen last August as the Shia rebels swept down from their stronghold in the mountains, demanding economic and political reforms. In the following months, they seized key state installations in capital Sanaa and forced the country’s US-backed authorities out.